Having a go at lino cut. I'm addicted to this now, it's so much fun! Sorry, hello, hope you are all well! As most of you know I love my art and fabric design, I wake up in the middle of the night thinking about flowers and patterns! Just lately it's been too cold for me to even consider going into the studio to screen print, theres been ice on the inside of the windows, brrrrrrr. So I've been looking at ways of getting my printing fix, in my living room in front of the fire. I decided to have a go at carving my own stamps as I wanted to produce some handmade tea towels and totes for my spring fair. I bought a block of mastercut and some basic tools from handprinted.net This is how I got on. 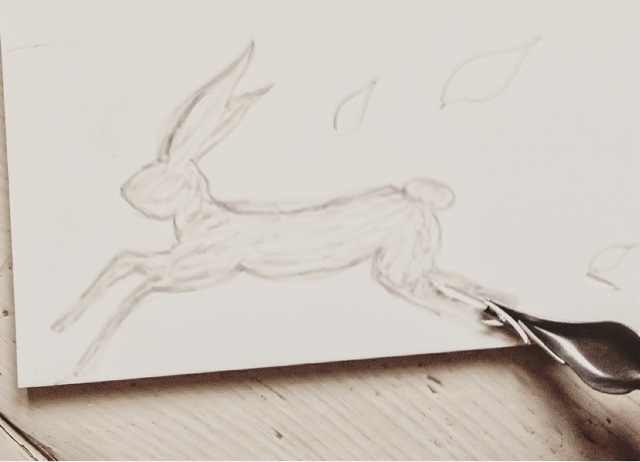 I had a practice at drawing hare's first then when I was happy I drew an outline onto my block. I was so nervous about making the first cut I can tell you. 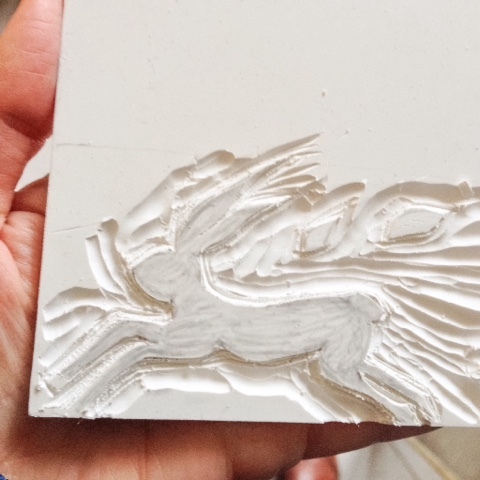 Very slowly I carved around my outline as I wanted the hare image to be solid, then snipped away the bits of mastercut I didn't need. 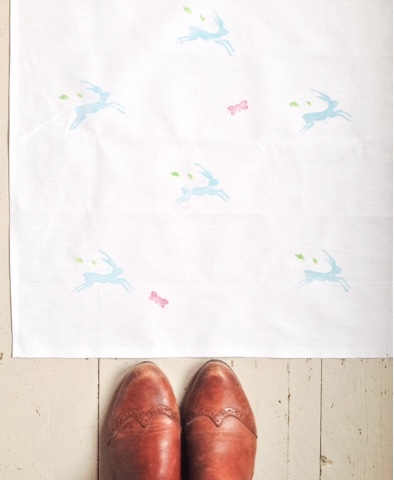 I then used fabric stamps to ink my design and print onto a tea towel. 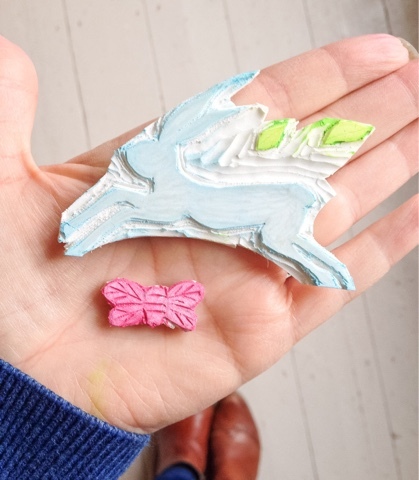 I love how you can colour certain bits of the stamp, and I particularly love how instant the whole thing is, other than the time consuming bit at the start, but then you have a stamp for life, and it's easy to re-use and clean! No standing in the shower rinsing out silk screens or blasting them with a hosepipe in the freezing cold. I then went on to make some bee's, a rose bud and a crown. I'm quite pleased with my first go, what do you think? I'm naming this one March Hare's. 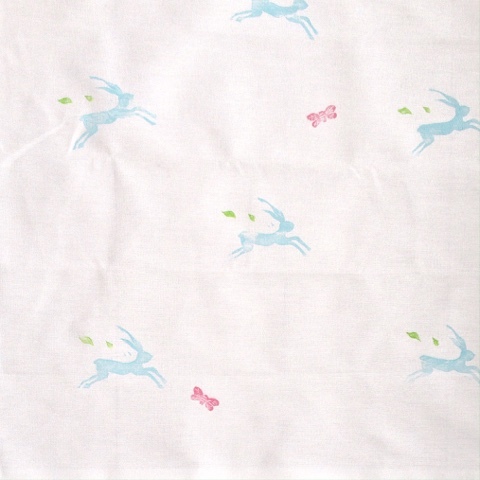 And I love the name 'March Hare'!!! It brings to mind, things magical and wild and all. Thank you Tessa, lovely to hear from you! It was so much fun, and is very addictive! 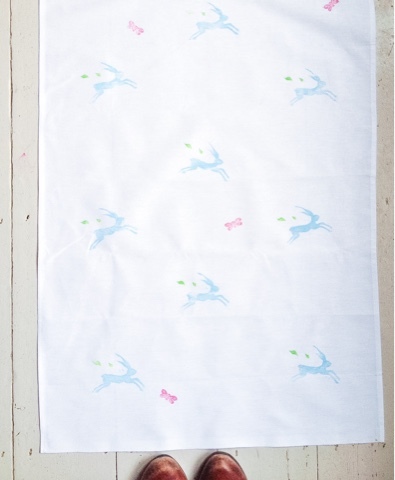 I need to order more tea towels now so I can get creating.